Enable TLS on the Edge management API. See the Edge Operations Guide for more, which is available from your private FTP account or on the Apigee Support Portal under Libraries (Edge for Private Cloud version 4.16.01 and earlier) and online at Configuring TLS/SSL for Edge On Premises (version 4.16.05 and later). 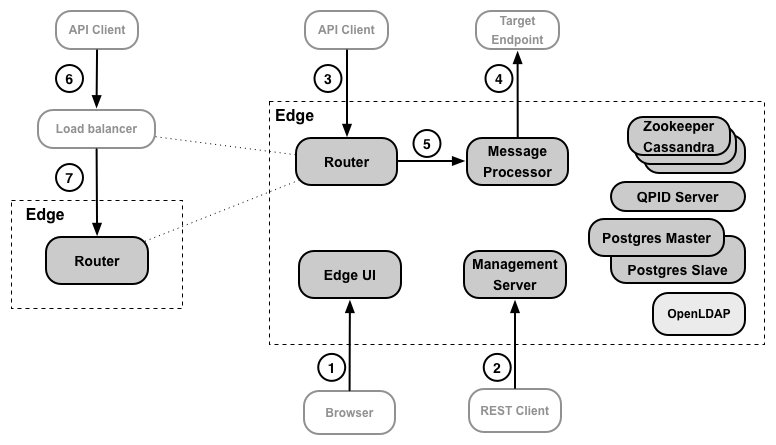 Enable TLS on API access through the use of virtual hosts on the Edge Router. See Configuring TLS access to an API for the Private Cloud for more. Enable TLS between Edge and a backend service provider. See Configuring TLS from Edge to the backend (Cloud and Private Cloud) for more. Enable TLS for communication between a Router and Message Processor. See the Edge Operations Guide for more, which is available from your private FTP account or on the Apigee Support Portal under Libraries (Edge for Private Cloud version 4.16.01 and earlier) and online at Configuring TLS/SSL for Edge On Premises (version 4.16.05 and later).. Enable TLS on the load balancer. This process is determined by your load balancer. If necessary, enable TLS on the Router for requests from the load balancer. Use the same process as you do for configuring TLS for a virtual host as described here: Configuring TLS access to an API for the Private Cloud. If the load balancer and Router are in the same security domain, TLS configuration may not be necessary. However, that is dependent on your network configuration. See Configuring TLS for API BaaS for more information.